Over the past few years, something remarkable has occurred in Latin America. For the first time since the Sandinista Revolution in Nicaragua in the 1980s, people within the region have turned toward radical left governments - specifically in Venezuela, Bolivia, and Ecuador. Why has this profound shift taken place and how does this new, so-called Twenty-First-Century Socialism actually manifest itself? What are we to make of the often fraught relationship between the social movements and governments in these countries and do, in fact, the latter even qualify as 'socialist' in reality? 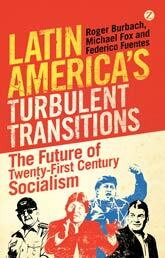 These are the bold and critical questions that Latin America's Turbulent Transitions explores. The authors provocatively argue that although US hegemony in the region is on the wane, the traditional socialist project is also declining and something new is emerging. Going beyond simple conceptions of 'the left,' the book reveals the true underpinnings of this powerful, transformative, and yet also complicated and contradictory process.